“True North” by Lou Marincovich, PhD, is a unique and personal read that is a mix of a coming-of-age tale, classic adventure, and scientific exploration. This is perhaps one of the most difficult books I have had to review because it is hard to quantify. If a book is bad or completely boring you simply have to say that; on the other hand, if a book is good or even great, you have to convey that. “True North” falls into the high-end of the middle ground category for me, making it difficult to review for multiple reasons. 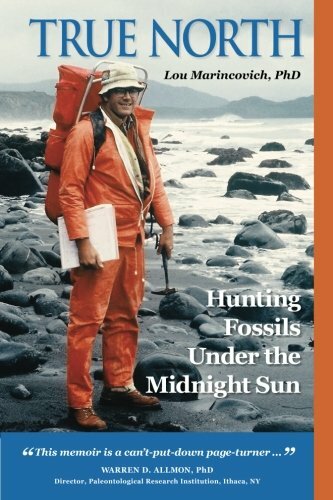 First, it is the memoir of Lou Marincovich, PhD, who by all accounts has had an interesting enough life, from his early years working on an oil rig through his life studying the fields of paleontology and geology. The book moves in chronological order from adventure to adventure and setback to setback. The biggest issue for me here is that the author never takes enough time investing in himself as a character or in the importance of his work. On the other hand, the writing is technically excellent; there are no misspellings or grammatical errors. This makes sense when you see that the author has already written many scientific articles. Another positive is that Lou is, at the very least, a very real and likable individual. Often in these types of memoirs the subject seems ridiculously unrealistic and the entire read seems it is just the author self-gratifying and indulging themselves. “True North” on the other hand, never feels like that. Lou does a great deal to make his recollections feel genuine and honest and at no point in this memoir does it feel like just an ego boost for the author. That fact alone makes it stand out to me from other similar titles. The second issue I had with the book is there isn't really ever anything at stake. By this I mean that it never actually offers the reader an enticing enough reason to move forward. If there had been then I feel like “True North” would have easily made a great book, but for me personally, I really needed that hook. I get that it is biographic, but it is still written in story form or at least it reads like it. I am not trying to judge the actual person, but more how that person is conveyed in the book to the reader. In summary, “True North” by Lou Marincovich, PhD, is technically well-written, reasonably-paced, and often interesting. It is also very genuine and believable. If you’re really into geology or paleontology and wonder what working in those fields would be like or if you have a PhD in those fields, you will enjoy this book. At the end of the day it truly is a labor of love on the author’s behalf.